This coffee will be fresh roasted for you. We expect Dillanos Coffee Roasters will roast and ship this coffee in 1-2 business days depending on their roasting schedule. This is the Tanzania brought to you by Dillanos Coffee Roasters. This Tanzanian Bourbon variety is grown in the fertile volcanic soil of the northern region of the country. The coffee showcases the bold characteristics east Africa is famous for. Dillanos have balanced the body, allowing the development of the natural sugars by taking this coffee to a deep roast level. Delicious. Strange little beans that are kind of a funny shape. Dark and yummy, smoky. This is one of the BEST coffees I have ever had in my life. SO GOOD. Less flavorful than I’m used to. Low acid, which I like. Suprisingly smooth given the dark oily bean. Might qualify it as a common coffee, sort of a “daily joe” vs anything special. No lingering flavor. Would not be great after a lavish dinner. But works as a morning cup. Please stop sending Dillanos coffees, this one is hardly drinkable. There is no flavor other than some carmelization of sugars and roast. There is no body, and the acidity is gross. Furthermore they call this a medium-dark roast and i have requested light roasts. im not sure why you sent this coffee, it was a mistake, please never send something like this again. I most likely will throw the remainder of this bag in the compost. Too dark of a roast for my preferences. This one was MUCH better than the last! I went for single origin because that's what I meant to do in the first place, and it is worth it. I will say I would prefer no more dark roasts, this was a bit on the darker side. I would love to try a nice light roast too, to really narrow if I prefer light or medium. Good balance, wish it had a bit more body. Smooth finish, slightly light roast. "This one made the office smell the best!" Perfect sweetness and has a full and rich body. This coffee has a really strong, yet pleasant and comforting, smokiness as well as an enjoyably heavy, smooth body. There are also hints of nuttiness and chocolate. However, as the coffee becomes tepid, the structure of the cup starts to weaken and the lesser flavors become eclipsed by the smokiness to the point where it becomes almost overwhelming. This is best enjoyed very hot when the emphasis on the smokiness is intriguing, inviting, and satisfying. Too dark for my liking. Seemed a bit too bitter and citrus-y. It was bold but good coffee. A little darker of a roast than what I am used to but smooth in taste. Only noticed the hint of citrus, not the chocolate it is supposed to have. We weren't a fan of this one. It was a bit overbearing. The roast was too dark for our taste. Decent coffee, darker roast, little to dark for me. Too dark for my taset. But if you like a full roasted, heavy coffee, it does that job well. I was not a big fan of the Tanzania. Body was nice, but I didn't get the sweetness I expected. I may have liked this more in a lighter roast, but any unique characteristics the coffee had seem to have been overshadowed by what appeared to be a full city roast. Loved the robust and chocolate-y flavor of the coffee! I taste light caramel notes followed by mild bitterness. Sadly, the majority of the flavor profile seems to be indiscernible due to darkness of the roast. While the coffee and cream coffee drinker may find this cup more palatable, it is much too dark for my liking. Love the citrus and chocolate notes. 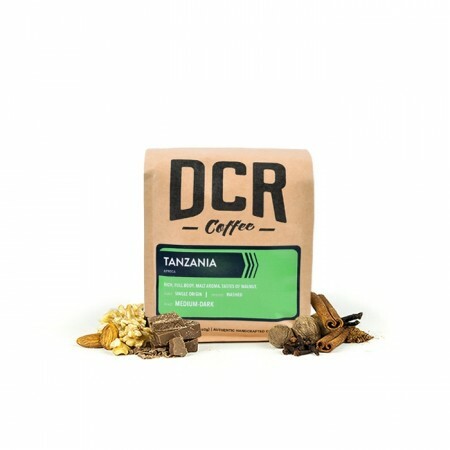 I find it extremely rare that a dark roast exhibits distinguishable notes of chocolates or citrus and this Tanzanian medium dark roast is no exception. So far I have brewed it using a v60 cone. I have also brewed it through a v60 into a coil to instantly cool it for iced coffee. I made some cold brew overnight as well. I've used these methods before with good result and have confidence in my own brewing level of competence. Unfortunately the coffee came out tasting bitter and burnt. Every once in a while I'll detect the faintest flavor of chocolate but not without it being quickly overcome with bitterness. Dillanos seems like they started off as a solid coffee roaster, however, I think that they may have lost their attention to detail when they switched to wholesale coffee. I believe this coffee could have potential but unfortunately it was untapped.